Hearthstone's villains have united for Rise of Shadows and Shacknews continues breaks down each card leading up to its April release. Today, Keeper Stelladris aids the Druid! Blizzard has revealed what's next for long-running digital collectible card game Hearthstone. The Year of the Raven is coming to an end and the Year of the Dragon is about to begin. The new Standard year will officially begin with the arrival of 2019's first expansion, Rise of Shadows, and that means a whole new set of cards are about to take Hearthstone into a brave new world. Twinspell: Give a friendly minion Lifesteal. Analysis: This could prove to be a valuable tool for the Paladin that's looking to stay alive in the late game. This could give Lifesteal to any number of Charge or Rush minions, which should help offer some health recovery in addition to helping remove some minions. But the Paladin is more likely to take a page out of the Mage's playbook. Standard Mages may not be able to use Baron Geddon with Lifesteal anymore with Frost Lich Jaina rotating out, but the Paladin will be able to attach Lightforged Blessing to it and heal for a heavy amount. 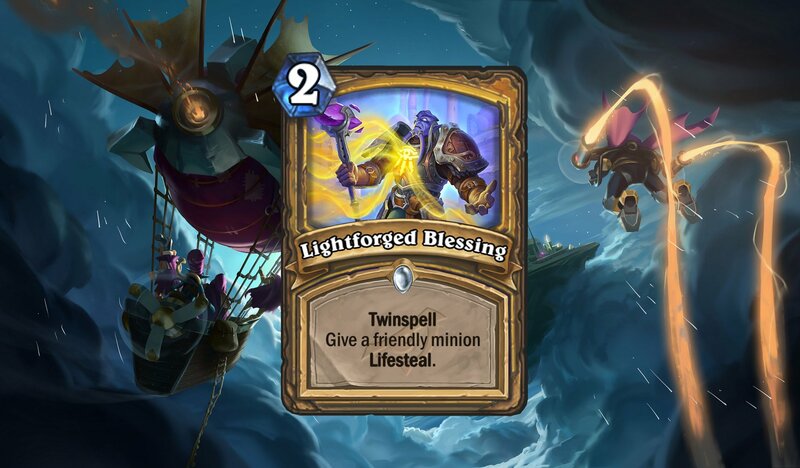 Popping Lightforged Blessing onto Baron Geddon and Abomination could prove to be strong plays and with more cards on the way, this spell might get even more potent with time. Twinspell: Summon a 5/5 Wyvern with Rush. Analysis: With Hunter set to lose a couple of tools with the Standard rotation, it gets a valuable new tool in Unleash the Beast. This offers up a 5/5 Rush, with the ability to use it twice over the course of the game. It's a slightly more reliable Animal Companion, in the sense that it works greater as a control tool. It's going to be hard to imagine Spell Hunters being a big part of the Standard meta going forward, with the loss of their legendary weapon and their Death Knight card. But if you're playing Wild and want to play around with this deck type, it has the potential to thrive there. 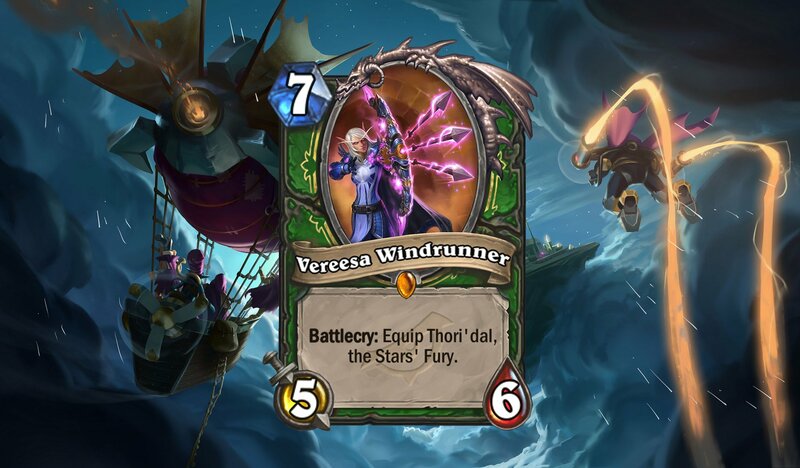 Analysis: At first glance, this looks like a different take on the old Fandral Staghelm. The key difference is that instead of whammying opponents with double Choose One effects, the Druid player must still initially choose an effect, but will get copies of both choices in-hand afterwards. That tosses in a little bit more strategy, especially because this only applies to Choose One spells. Apologies to anyone hoping to take advantage of this effect on something like Druid of the Claw. 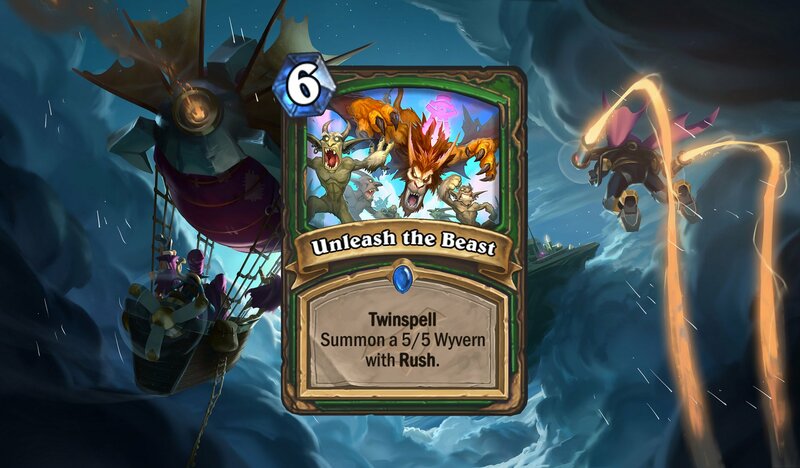 Needless to say, this is awesome with Wrath and Power of the Wild. But it also gives a new lease on life to mediocre/passable cards like Mark of Nature and Mark of the Loa. As for Wild Druids? Well... how's that Jade Idol card looking right about now? Secret: When your opponent casts a spell, give your minions +2 Health. Analysis: Paladin secrets aren't always the most powerful thing in the game and, in fact, can be pretty weak in the Standard game. But they're usually half-decent situational pickups off of Discover effects and this one will certainly fall in that category. Never Surrender is something you'll want to have handy against certain classes in the game, just because it can thwart certain attempts at removal. Cards like Swipe, Backstab, and Blast Wave are especially going to have a bad time against this spell. Wild players, you may want to consider adding this to your Odd Paladin lineup, because it might help keep some of those Silver Hand Recruits standing. Battlecry: Destroy a friendly minion to add 2 random Lackeys to your hand. Analysis: The EVIL Genius is having a 2-for-1 sale. It's one of your friendly minions for two new ones! It's just a shame that minions like the Devilsaur Egg are rotating out, though maybe this can work on something else, like the Void Analyst. The goal with this minion is to keep adding to your zoo numbers with its own body, as well as the bodies of the Lackeys. Multiple bodies fills the hunger of one Spirit of the Bat. And if you need everlasting board presence, maybe find a way to implement this with Glinda Crowskin, either by playing the Genius or a multitude of Lackeys in a single turn. Deathrattle: Add a Lackey to your hand. Analysis: This is a much more vanilla minion, compared to the EVIL Genius, so whether you want to incorporate it into your lineup ultimately depends on how much you like the Lackeys. 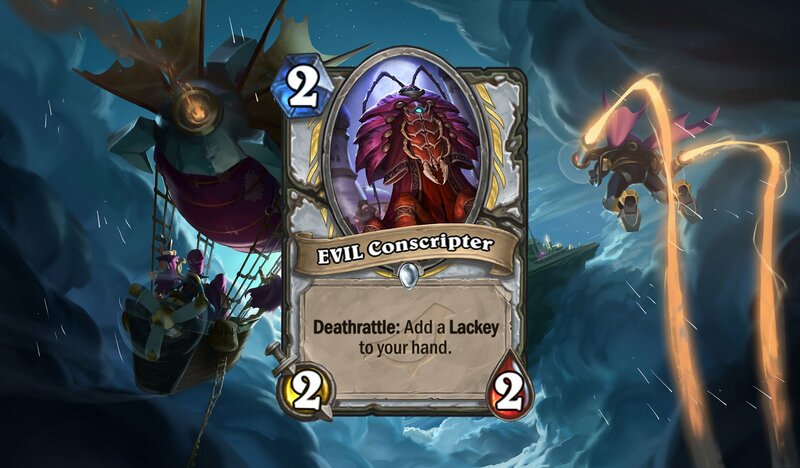 There's some light synergy here with Spirit of the Dead, allowing the Priest player to potentially sacrifice both the Conscripter and the Lackeys to add them to their deck later. The problem here is, there's another Priest Legendary we'll get to later in the week that's uber cool and you won't want to poison its well with 1/1 Lackeys. So consider this along the bottom rung of the Priest minions for now. Battlecry: Equip Thori'dal, the Stars' Fury. Analysis: Vereesa is a decent 5/6 body, but let's address the Battlecry. What is Thori'dal, the Stars' Fury? In Hearthstone, it's a 2/3 weapon that grants the Hunter player Spell Damage +2 each time they attack for the rest of their turn. So what does this open the door for? Well, the first thought is that double Kill Command can now strike for a whopping 14 damage. And let's be honest, are there any other uses for this in Standard at the moment? Vereesa coming so late in the game almost ensures that this is meant to set up a killing blow. But if the Hunter does need this for something other than face damage, it gives a little extra flexibility to Baited Arrow, making it a little easier to bring out a 5/5 Devilsaur. And later in the game, it sets up potential fireworks with Zul'jin. Rush. Deathrattle: Summon a 1/1 Murloc. Analysis: A fairly vanilla 2/1 that can remove some early board presence, while leaving behind a 1/1. Outside of the Hunter, the synergies aren't going to matter too much here. It's a half-decent response to a Turn 1 play, but it's a wasted play against those 1-Cost 1/3 minions. I wouldn't count on this as a reliable Turn 2 drop. There's much better out there. Battlecry: Draw 2 minions from your deck. Set their Attach, Health, and Cost to 1. Analysis: Jepetto Joybuzz doesn't look very intimidating on the surface and his effect certainly doesn't strike fear into anyone's heart until you dive much deeper. If those minions are part of combo pieces, like... oh, I don't know... Malygos, then this effect pays off big time in the long run. More than that, picture a Rogue playing this alongside something like Togwaggle's Scheme. Simply play Malygos and make multiple copies of it on Turn 10. Then play Jepetto on the next turn and pull two of those Malygos copies out and discount them to 1 mana each. That leaves a lot of mana to wreck the opponent in a single turn. There's a lot of room for shenanigans with Jepetto. Be on the lookout for what could be a potential scourge for the next expansion. Deathrattle: Add two 4/4 Dragons to your hand. Battlecry: Give all Dragons in your hand +3/+3. Analysis: Let's analyze both of these at once, because the idea appears to be to use both of these cards in tandem. 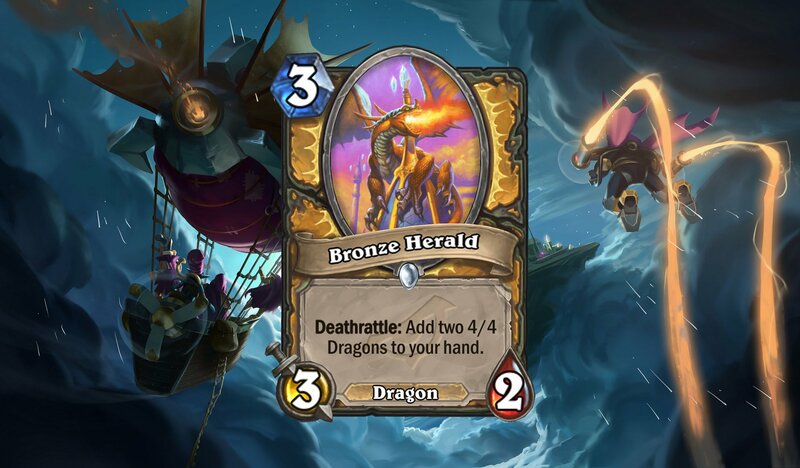 Bronze Herald is here to drop a pair of 4-Cost 4/4 Dragons upon its death. At worst, it'll give Paladin players the equivalent of a pair of mid-range level Twilight Drakes. The trouble is whether the value is worth plopping down a 3-Cost with relatively weak 3/2 stats and that's ultimately up to the player. The answer will almost certainly be "yes" in Arena, given the card's potential value. Now let's turn to Dragon Speaker, which turns those 4/4 Dragons into 4-Cost, 7/7 Dragons. All things considered, that's a strong series of plays for the Paladin player, especially if they can keep the board under control long enough to allow these 7/7 Dragons to do some work. Truth be told, even without the Bronze Herald's Dragons, the Dragon Speaker will fit beautifully into the Dragon Paladin's hand, just because of the frightening stats that it can give to Dragonmaw Scorcher, Crowd Roaster, and Ysera. 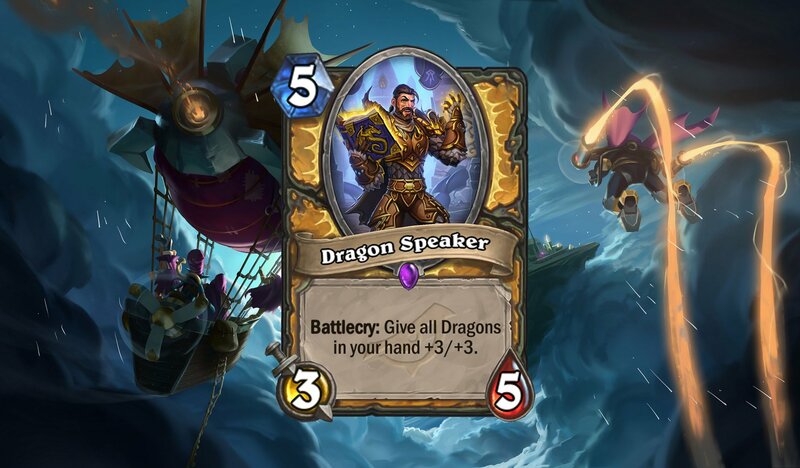 Play the Bronze Herald if you'd like, but if you're centering your Paladin deck around Dragons, the Dragon Speaker will be a must-have. Analysis: For the Standard Priest, this is meant to replace the Diamond Spellstone that's about to rotate out. And some may be dreading this, simply because it might sound like the OTK Priest brandishing Prophet Velen, Malygos, and Mind Blast isn't going anywhere. However, it should be noted that Radiant Elemental is set to rotate into Wild. And since Radiant Elemental is the key component in making that OTK combo work, Mass Resurrection won't work the same way. That's not to say that clever Priest players won't find their way around this. Don't think that they won't find a way to take advantage of Mass Resurrection's ability or the text that reads "3 friendly minions." That's not the "different friendly minions" text that's on the Spellstone, so keep that in mind when putting your combos together. 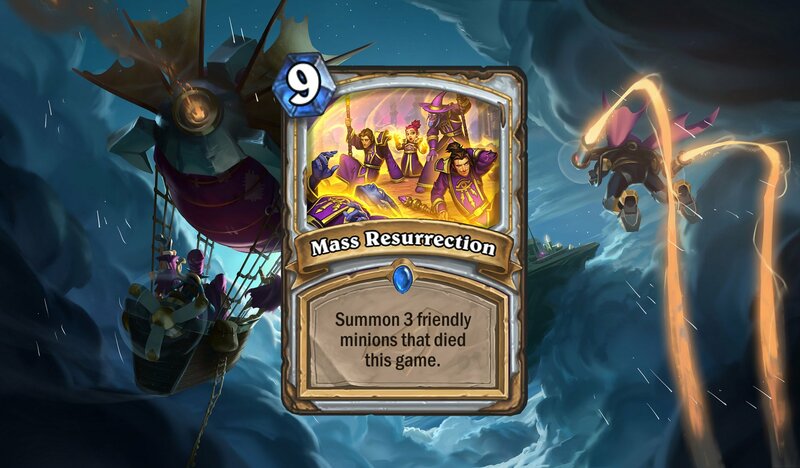 Mass Resurrection shouldn't see much play in Wild, where Wild Priest will likely keep on trucking with the Spellstone over this new spell. Shacknews will continue to monitor cards and analyze them in the lead-up to the next big Hearthstone expansion. Come back tomorrow, as we continue with more community-revealed cards. Hearthstone: Rise of Shadows is set to release on April 9.